If you’re not looking for a bar scene so much as a chill place to share a few drinks and snacks while catching up with a friend, this is the place. For after-work post-gaming, heart-to-heart talks, or a romantic prelude to an evening, sit on the patio, beneath the olive tree and sparkly lights, and enjoy a Davanti spritz, well drink, or Moretti draft for $5, or a classic martini or glass of house red or white wine for $6 between 4 and 6pm. Snacks for sharing range from chicken liver pâté ($4) to shrimp, calamari, and oyster fritto misto ($9). Sunday 3-6pm: $5 draft beers and wines, $6 well cocktails and Davanti Spritz, $7 sangria and martinis. Appetizers $5-$8. Monday 3-6pm: $5 draft beers and wines, $6 well cocktails and Davanti Spritz, $7 sangria and martinis. Appetizers $5-$8. 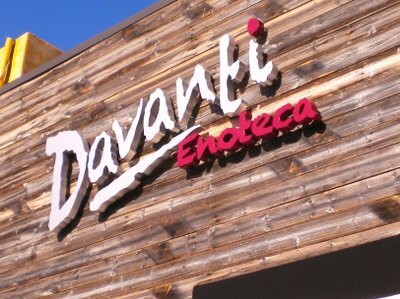 Tuesday 3-6pm: $5 draft beers and wines, $6 well cocktails and Davanti Spritz, $7 sangria and martinis. Appetizers $5-$8. Wednesday 3-6pm: $5 draft beers and wines, $6 well cocktails and Davanti Spritz, $7 sangria and martinis. Appetizers $5-$8. Thursday 3-6pm: $5 draft beers and wines, $6 well cocktails and Davanti Spritz, $7 sangria and martinis. Appetizers $5-$8. Friday 3-6pm: $5 draft beers and wines, $6 well cocktails and Davanti Spritz, $7 sangria and martinis. Appetizers $5-$8. Saturday 3-6pm: $5 draft beers and wines, $6 well cocktails and Davanti Spritz, $7 sangria and martinis. Appetizers $5-$8.